This week, when you find yourself scrambling for a last minute gift, dreading the shopping malls, you may be able to take advantage of regifting. During any time of gift-giving, from weddings to baby showers, Christmas and birthdays, you inevitably unwrap at least one present, and are rewarded with pure puzzlement. A myriad of thoughts flash through your mind: Who would give me this? Do I look like I enjoy this? I know this wasn’t on the registry. It’s gotta be from….yup, it is. You smile widely, say a hearty thank you, and put it with the other presents knowing it will never see the light of day in your house. This really isn’t uncommon. Many of us give gifts that we would like to receive, assuming it is something anyone would love. Some of these gifts we are stuck with, like the gaudy brooch from your husband’s sister that she insists on seeing at every family dinner; some gifts we are glad to have, like the antique doilies from your mother-in-law that you still treasure as a family heirloom. Some gifts are returnable for something you would like. Other gifts seem to sit on that one closet shelf in present purgatory; you can’t bring yourself to throw them out or even donate them to Goodwill, but they are nothing you would use. 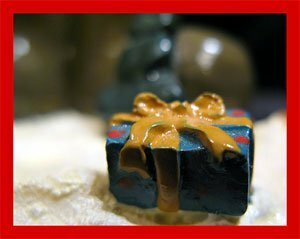 In the past, many have regarded regifting as cheap, stingy, or ungrateful, but it seems to be gaining more traction in the economic downturn. Why has it been controversial? Some people believe a gift is only as thoughtful or worthwhile as what was spent on it. To those people a gift without a gift receipt is one without care and love. The main concern I hear is: “What if I regift something and the original giver becomes offended?” If it makes anyone feel better, before I figured out how to wisely regift, I made the mistake of giving a gift back to the person who gave it to me. I was stunned and embarassed, even though my Aunt thought it was quite funny. Using some simple regifting etiquette can minimize the potential for any faux pas. Unless you’re known for giving gifts from your local Goodwill, you really should regift only new or new in package items. No one was truly excited to get their older siblings hand-me-downs, so don’t give a jacket that you just decided to stop wearing. Even though it’s a regift, it should still be an actual gift, something you are proud to give. The exception to this is giving a family heirloom (obviously) or if you like to give vintage or antique gifts/collectibles. M.P. Dunleavy from MSN Money advises not to give gifts that people have seen sitting on your shelves, but I give a little leeway. If you know someone who’s been coveting a piece of kitsch in your display case that you’re tired of dusting, I see nothing wrong with giving someone a gift you know they really want. Gift exchanges with price limits have been getting more popular as families and companies grow larger. Even though you didn’t spend money on it, giving a $50 crystal vase at an exchange with a $20 limit, might not always be the best idea. Do not give a gift in the same old dusty wrapping paper it’s been in for however long. You are already spending nothing on the gift. Go to the dollar store and pick up a little wrapping paper. Above all, please remove the card addressed to you. It’s not rocket science, but sometimes an errant scrap of paper taped to the bottom of a box is all it takes to “out” your regift. Since my embarrassing regift moment, I developed a system so that it won’t happen again. I attach a Post-it or sticky note to the gift before it goes onto the gift shelf (or into the gift drawer, etc.). On the sticky note I write a detailed description of the item, who gave it to me, and when. Sometimes it’s easy. One of my old companies had Christmas gift exchange that was specific to regifting. It also had a competition to bring in the most awful thing you’d received that year for a prize. If you feel comfortable, or even feel morally obligated to disclose your regifting, you should. There have been occasions where I have received a present that is nothing like me, but I know is collected by a loved one. I honestly can’t wait to rewrap that present and send it to them. When someone receives a gift that they truly love, from someone they appreciate, the source of the gift is of secondary concern. Thank you for your comments. I think I always had a pleasant stance to regifting because I loved it when people passed on family heirlooms (a highly prized form of the art). I hadn’t even thought about the “greenness” of it. I just grew up in a tight knit family with depression-era great-grandparents who didn’t throw anything away. It’s nice that people are becoming more conscious about what’s trash, and what might be someone else’s treasure. You are right that it is becoming more acceptable. In part I think that it is because of the whole green movement. People just feel better about the idea of items actually being put to use instead of being thrown away. I never re-gifted. But it’s good to know.